Dry ears can be an annoying problem. Dry skin in ears can be caused by a wide variety of things, such as too much wax in the ears or too little. It might be caused by a change in the weather, a new shampoo or facial cleanser. Fortunately, dry ears can be helped with various home remedies. Understanding what causes dry, flaky ears can help you figure out if the condition is a simple one, or is indicative of a more complex underlying medical problem. Dry or flaky ears are caused by a multitude of things, and fortunately, you can usually pinpoint the problem rather quickly. One of the most common problems is cleaning the ear canal too often or too vigorously. When you do this, you wipe away ear wax which is actually meant to protect the ear canal. Without that protection, your ears may become dry, flaky and even painful. Some people suffer from skin conditions that cause too much oil to appear on the skin, while others suffer from an overgrowth of yeast on the skin. Either one of these problems can lead to dry, flaky ears. Itching might also accompany these issues. Another common problem is an allergic reaction to something new, such as a shampoo that touches the ears when you use it on your hair. It might dry out your skin enough that the result is dry skin in ears, and the pain that goes along with it. Don’t use cotton to clean the ear canal. Let the ear clean itself. If you must clean out some ear wax, use a lubricating method, such as a water pick designed for ear use. Avoid getting soap or shampoo into the ear. If you want to be certain to avoid this, use ear plugs to block the ear until you get out of the shower. Let your ear dry naturally after your shower. Using anything to dry the ear can push wax further into it, or can damage the delicate dry skin. Wear a tight cap while swimming to prevent water from entering your ear canal. If you take all these steps but you are still suffering, it might be time to call the doctor. Definitely see a doctor immediately if your ears are itching, you are experiencing significant pain or discomfort, there is a discharge coming from your ear, or your hearing has changed. This soothing, protecting gel can help alleviate some of the dryness around the inner and outer portions of your ear. This works best if the problem is the weather or humidity. Remember not to put the petroleum jelly in the ear canal. This natural oil can help keep the ear canal lubricated, which can alleviate the dry skin problem. 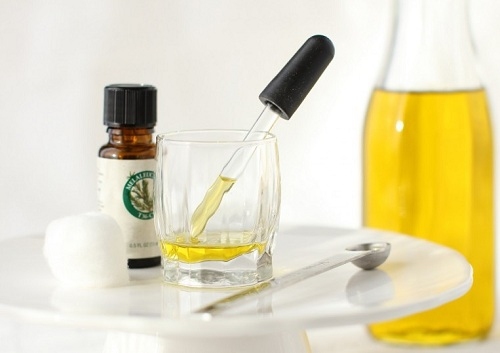 Use a small dropper to apply olive oil directly into the ear canal. Just one or two drops should be enough. Rub the ear well to ensure that the oil is spread around. Do this once per week. If you are suffering from an overabundance of oil in the ear, washing your ears with a thin fiber washcloth can help. Remove any crusting of the ear, and then rub it carefully with the washcloth. Be careful not to get too deep into the ear canal. If you have an infection, your doctor might prescribe antibiotic drops to help clear up the problem. If that doesn’t work, you might need to be tested for a fungal infection – though rare, it does happen. In addition, your doctor might prescribe pain drops to help with dry skin in ears that persists and causes serious pain. Server responsed at: 04/25/2019 9:52 p.m.